ඩයටම් බැසිලාරියෝෆීටා වංශයට අයත් වේ. කරදිය ප්‍රාථමික නිපැයුම් ප්‍රජාවේ ප්‍රධාන ස්ථානයක් ගනී. 7/10ක් කරදිය වේ. මිරිදිය, කරදිය මතුපිට ස්ථරවල ඒක සෛලීය ප්‍රභා ස‍්වයංපෝෂී වේ. සෛල බිත්තිය සෙලියුලෝස්, පෙක්ටීන් හා ප්‍රධාන වශයෙන් සිලිකන් ඇත. දර්ශීය ජීවියා පිනියුලේරියා වේ. මොවුන්ගේ විශේෂිත ම ලක්‍ෂණය සෛල වටා ඇති අලංකාර පාරදෘෂ්‍ය සිලිකන් කවචය යි. එක මත එක පිහිටි දෙපියනකින් යුතු ය. කවචයේ ඇති තන්තු ආධාරයෙන් චලනය විය හැක. ක්ලෝරොෆීල් A, B, හා කැරොටිනොයිඩ ඇත. ප්‍රභාසංස්ලේෂක වර්ණය ෆියුකොසැන්තීන් වේ. සංචිත ආකාරය ක්‍රිසොලැමිනරීන් වේ. අලිංගිකව ද්විඛණ්ඩනයෙන් ප්‍රජනනය කරන අතර ලිංගිකව ඌනන විභාජනයෙන් කශිකා සහිත සචල පුංජන්මාණුවක් හා අචල ඩිම්බ සාදයි. පුං ජන්මාණුවට තනි කශිකාවක් ඇත. E. Virginia Armbrust, et al. The Genome of the Diatom Thalassiosira Pseudonana: Ecology, Evolution, and Metabolism. Science 306:79-86. 2004. Ben Waggoner. University of California, Berkeley. Diatoms: Life, History and Ecology. Christopher D. Clack, Eileen Cox, Katie Bantley.. Diatom Morphogenesis. 1994. Doe Joint Genome Institute. Diatom Genome Reveals key Role in Biosphere's Carabon Cycle. Sept 30, 2004. E. Fourtanier, J.P. Kociolek, J. Demouthe California Academy of Sciences. Department of Inverebrate Zoology and Geology. Diatom Collection. Bacillariophyta. J. La Claire.University of Texas. Selected handouts For Biology 324. Diatom Life Cycle and History. January 2005. Jacob Feldman. Bacillariophytes - Diatoms. The Micropaleontology Society. 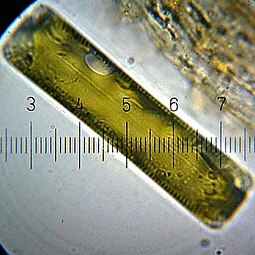 Diatoms: Algae with Animal Traits. Science, 1 Oct., 2004. Owen Davis. University of Arizona. Micropaleontology. April 2003. Staff, Star Tribune. Species list. June 11, 2004. මේ පිටුව අන්තිමට සැකසුවේ 28 ජූනි 2013 දින දී, 10:11 වේලාවෙහිදීය.